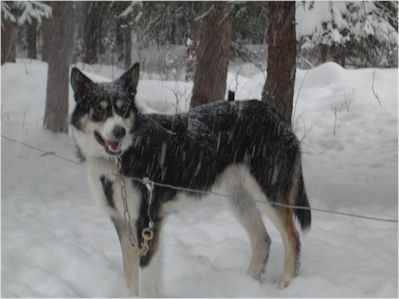 For the purposes of this paper I have used the term Alaskan Husky to refer to any animal of husky looks, born and bred in Alaska to pull in harness, with its genetic history primarily founded by Alaskan Native Dogs, from either or both interior village bloodlines or coastal Eskimo dog bloodlines. 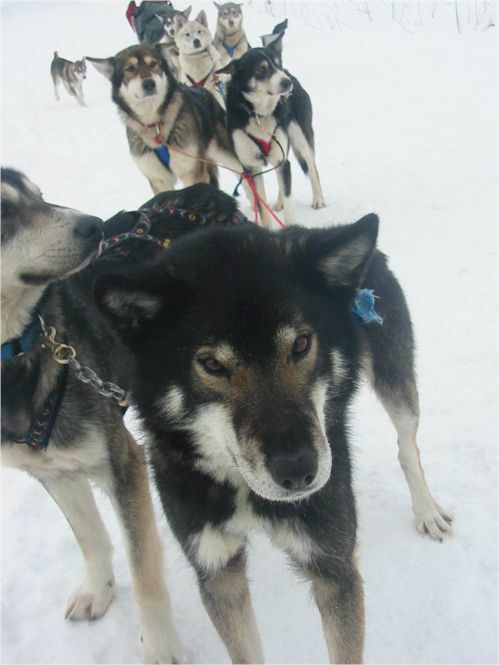 I use the term sled dog to describe any dog that pulls in harness for any application and racing sled dogs to describe any dog bred specifically for speed and endurance, used to compete in sled dog races. This terminology may or may not be shared by other mushers. Most people I have been around simply refer to sled dogs as sled dogs and then later in the conversation it becomes more specific about types, bloodlines and usage. Most sled dogs in Alaska are a conglomeration of Alaskan Husky and other breeds that have been added and selected for what ever use a particular musher has. My descriptions and analysis of the history of the Alaskan Husky probably differs from many articles of late. It is based less on modern racers opinions and knowledge of the modern history of sled dog racing, (which is readily available in numerous publications), and instead is more focused on an interest in and study of the early history and prehistory of Alaskan dogs. This complex topic is consistently left out of, or skipped over with a brief word or single sentence, in discussions concerning the beginnings of our sled dogs here in Alaska. The simple fact is however, that native dogs have been here in Alaska for thousands of years, and they form the genetic base of our modern Alaskan Husky. The history of the Alaskan Husky starts in no other place than prehistory, that is, the vast time before Europeans and Russians came to North America, and with the Native Village Dogs that once populated this region. Indeed, no discussion of Alaskan dogs would be complete without at least the mention of Pre-Columbian Native Dogs in North America, of which there were a huge variety of size, description, and type. Several careful scientists are at work to understand the nature of this aspect of prehistory. Prominent researchers are, R.K.Wayne, Jennifer Leonard, Susan Janet Crockford, Juliet Clutton-Brock Marion Shwartz, N. Nakarmura, Stanley Olsen, Roe, Caries Vila, Peter Savolainen, and many others. Their areas of study cover many disciplines: Anthropology, Archeology, Archeozoology, Migration, Biology and Genetic research. At one time indigenous dogs were numerous on this continent. Dogs were of all sizes and descriptions. There were everything from the small Innu Canoe Hunting Dogs, to Salish Wool dogs who were specially bred for their wool, which was harvested for blankets and clothing, to hunting Tal Tan Bear Dogs, small enough to fit inside your parka. In addition to these smaller native dogs, common Indian or village dogs were found all over North and South America, of which the Alaskan Village dogs were a northerly version. At the end of this article, please see a list of wonderful books and museum papers that one can read as resources for further study. Dogs were crucial in varying degrees to many tribal groups across North America, and were used for many important tasks, such as packing heavy loads in the summer, and dragging supplies on snow in the winter as the nomadic peoples of Alaska traversed from place to place. Dogs were also used for hunting and tracking. Dogs were companions and babysitters, as well as early warning systems for bears, enemies, or other forms of danger. 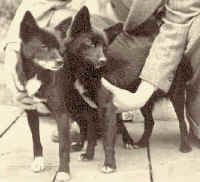 Most nomadic peoples did not selectively breed these dogs unless unwanted puppies were culled for a variety of reasons. (2) Like most nomadic tribal peoples, castration was not practiced until the turn of the century, and selection was based on need, not looks. Interior dogs sometimes had short half or broom tails, were of a more slender or rangy nature than Eskimo dogs. Unlike dogs of the lower forty eight, they were photographed briefly before becoming totally amalgamated by European and Siberian breeds. Some of these photos can be viewed on VILDA, the Alaskan digital archive of museum photographs. It is also helpful to research the Horse Creek Mary image, as this photograph from the turn of the century depicts two wonderful examples of Interior (Atnha) Village dogs. Although Coastal Eskimo dogs have been preserved in today's Inuit sled dog, Canadian Eskimo dog, and Greenlander- the Interior Village dogs are a thing of the past. It would take an extensive and prolonged archeological and accompanying genetic study to determine just how much original strain remains in any of today's Alaskan Village dogs, as outside dog breeds came to Alaska during the Gold rush and have added to the Alaskan Husky make up. Miners tried their hand at copying the Eskimo dog as they became more in demand by breeding the Saint Bernard and Newfoundland to captive female wolves. The results were not probably what they expected as most high content hybrids would rather work out the pecking order than work as a team. Any Large dog that could pull a load was added to the mix. Lots of people came to Alaska during the gold rush, bringing and breeding dogs for hauling huge loads of supplies. Mail run dogs were also kept for hauling the mail, up to 700 lb loads of mail were pulled by dogs. Indeed, they had to be hardy. Siberian Husky was added to much of the Interior Alaskan dog population when Leonard Seppala with his Siberian imports, entered the scene. These dogs were fast and racy compared to the larger slower Eskimo dogs and other large mixed breed dogs, and the new dogs became popular for their hardiness, happy natures and hard work ethic. Continuing with Roland Lombard in the 1920's and 30's, racing with Siberians became all the rage, and many of these dogs were taken to villages and mixed with the native village dogs. Like the Alaskan Malamute, eventually Siberian Huskies became the product of closed stud books and ridged AKC standards. Today, one can still see strong Siberian blood in many Alaskans, as those lines continue to be favored by some mushers. In addition to AKC Siberian Huskies, Racing Seppala Siberians are sometimes favored by sprint mushers, or simply a part of the genetic heritage of their racing dogs. Its ironic that those dogs have now become inbred to the point that some Seppala breeders are now backcrossing with Alaskan Huskies. Hounds, pointers, and Irish Setters were experimented with early on. One can view photographs of the famous "Balto" to see an example of an early mixed breed husky-hound or pointer racing dog. He certainly resembles some of the racing dogs of today. All of these breeds made their way to villages in Alaska, and into to the village dogs that remained. 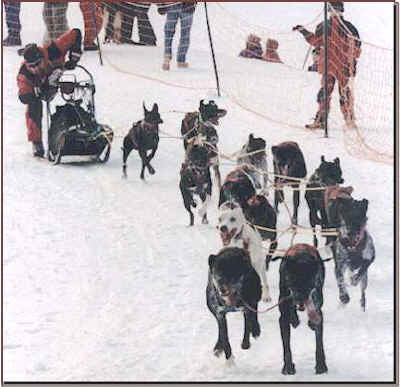 All of these dogs also made their way into toady's racing sled dog, a mix of the evolving village dog along with its famous Siberian background, have continued to receive admixtures of greyhound as big mid distance and distance racing experienced resurgence in Alaska in the 1970's. Now days Pointer and even Saluki have been experimented with in racing kennels. The new Eurohound is a choice for many sprint mushers. A Eurohound is a cross between an Alaskan Husky and German Short haired Pointer. This cross first successfully entered the competitive sled dog racing world in Scandinavia. It is one of the most formidable racing dogs in the world, combining the husky's centuries-honed sledding ability and a pointer's enthusiasm and athleticism. I have also seen Border Collies and other breeds added recently. I have mixed feelings about the racing Alaskan sled dogs of today, some of them for me fall into no husky category whatsoever. Some who race sprint dogs prefer a pure bred pointer altogether. Many racing bloodlines in Alaska have become extremely inbred, as famous dogs who make names for themselves are voraciously sought after for their fast genes. 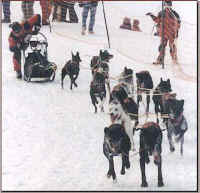 Racing dogs in Alaska are all related to certain dogs such as Lingo, Sailor, Scotty, or Riker, to name just a few. Its not clear to me whether or not the recent pointer and other breeds admixture have simply somewhat alleviated the inbreeding hazards in Alaskan dogs or if those breeds have really improved upon the overall integrity of racing dogs. What is lost and what is gained for the dogs? Short coats and a different personality, lack of toughness of bone structure, quality of feet, inability to live outside and withstand cold etc. are some of the problems I have had related to me from some mushers, in associated with breeding in European bloodlines for speed alone. Some mushers complain of a lack of mental toughness as well. Some sled dog racing kennels have to keep their dogs inside a heated barn and the animals have to wear coats when they run. I have also witnessed many, many dogs at the local sprint track picking up their feet, as they shiver to keep them warm one at a time. They may love to run, but they certainly don't enjoy the climate! Still other dogs who have managed to retain some sort of coat, seem to do fine in the far north chill. Whatever bloodlines they sport, whether distance or sprint, racing sled dogs are the best at what they do, and they do it magnificently. Some of them are huskies and some are not, some are a carefully blended mix that just wants to run, run, and run. 6) First Nations, First Dogs B.D. Cummins, Canadian Ethnocynolgy Destilig Enterprises, Alberta Canada, 2002. Stephanie Little Wolf is a singer, songwriter, poet and research technician. She attended Cabrillo Junior College, and graduated from The University of California, Santa Cruz in 1996. 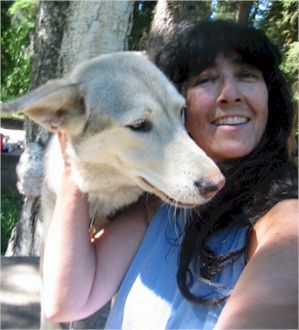 She has lived and worked in Alaska for many years, preserving her family's bloodline of sled dogs which she inherited in 1989.